Canadian Thistle is classified as a noxious weed in Wisconsin. I love the way “noxious weed” sounds. I thought weeds that are the baddest of the bad are listed as noxious. I found out it’s actually bad weeds, which are economically feasible to control. I’m shocked. It’s like the government having a most-wanted list with only relatively easy-to-catch criminals. I can tell you why Canadian Thistle is a noxious weed on our farm. Two words: Perennial and Rhizome. Perennial means it comes up year after year in the same area. 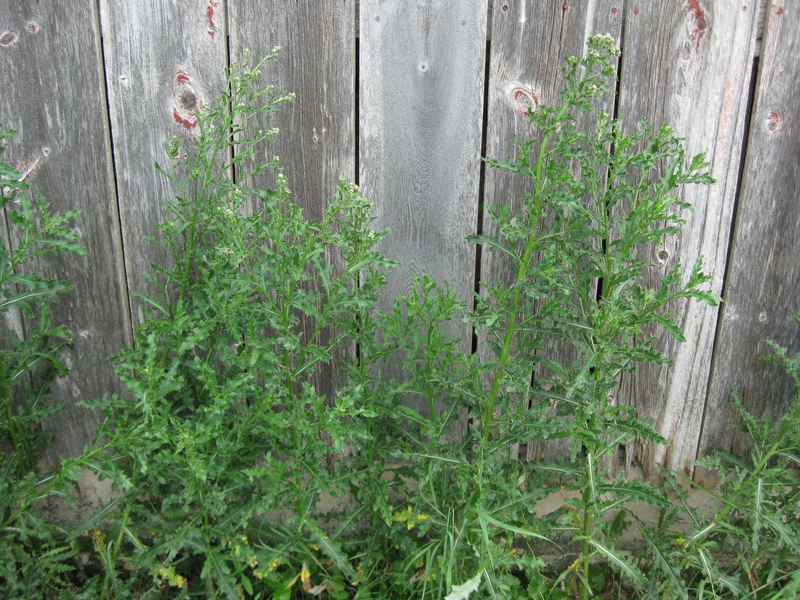 Most thistles are biennial and relatively easy to control. Don’t let the second year growth go to seed, and cut out the first year’s growth which is a rosette growing close to the ground, and you’ve got it licked. A good herbicide applied around the first of June may kill two years worth of thistles, also. A Rhizome is a root that travels laterally underground and sends up new shoots every so often. This is a powerful weapon in a plant’s arsenal. Kentucky Bluegrass is another example of a plant which uses rhizomes to expand. The picture below is a powerful example of rhizomes. 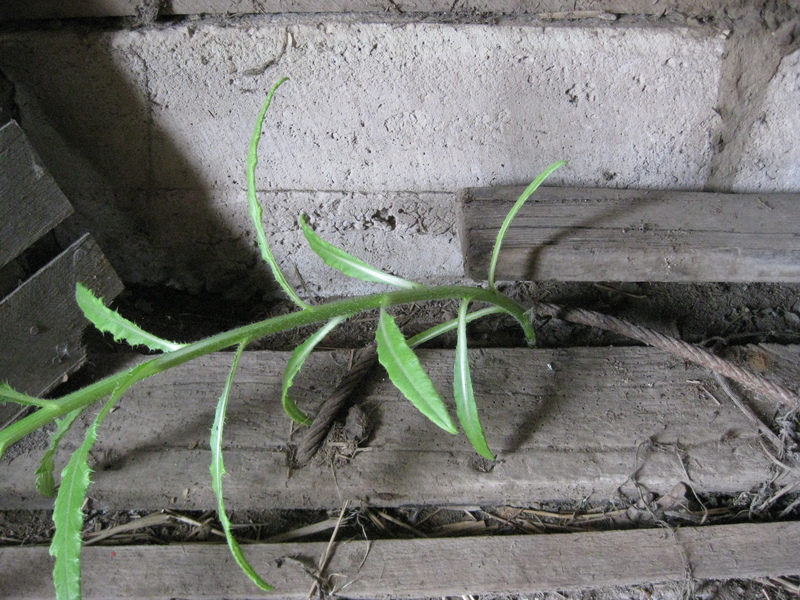 The Canadian Thistle growing along my machine shed found a crack in the concrete and pushed up a new plant inside the shed. It’s a continual struggle to carve out a little space of our own. Without us here, nature would overwhelm this place. It reminds me of a poem I had to memorize in High School English. 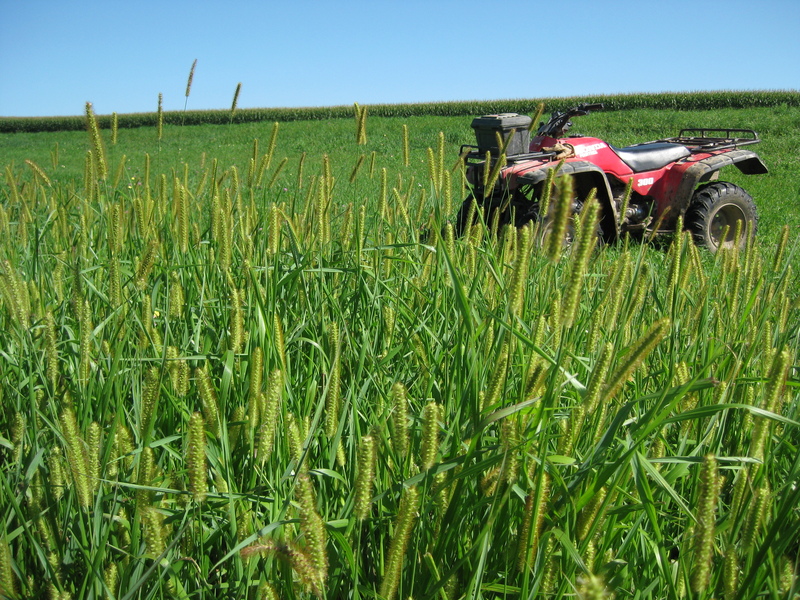 Giant Foxtail is an invasive weed from Asia that we have entirely too much of on our farm. It prefers high ph soils that have been compacted. Our soil, mere feet above a limestone base, is consistently neutral to alkaline. This picture was taken where the cows compacted the soil, last march. I had some hogs in what I thought was a secure pasture. I was encouraged, because they were nibbling on the foxtail, as well as the other grasses and forbs. If hogs would eat it, maybe I could tolerate it. Unfortunately, one morning I found a gate popped off its hinges and some of the pigs gone. 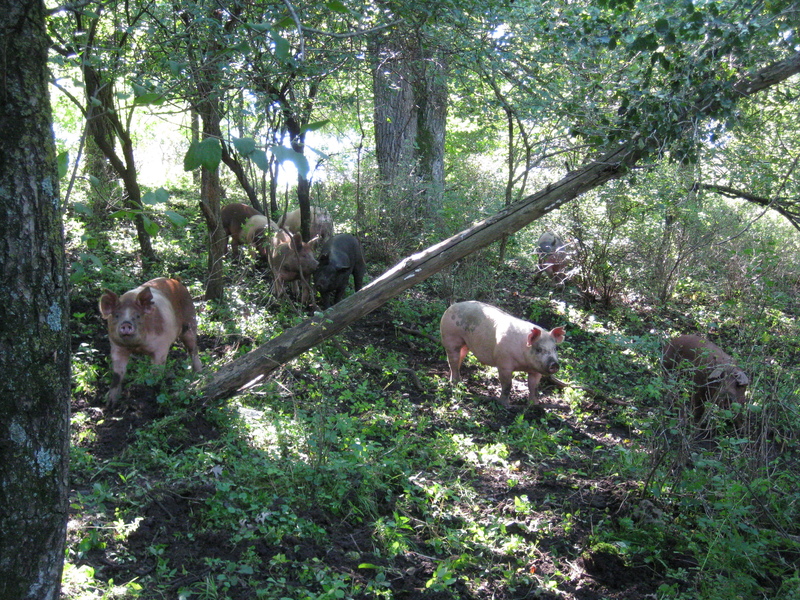 I locked up the other pigs and set off into the woods looking for them. This is what I found. I felt like Dian Fossey, the first time she observed gorillas in the wild. 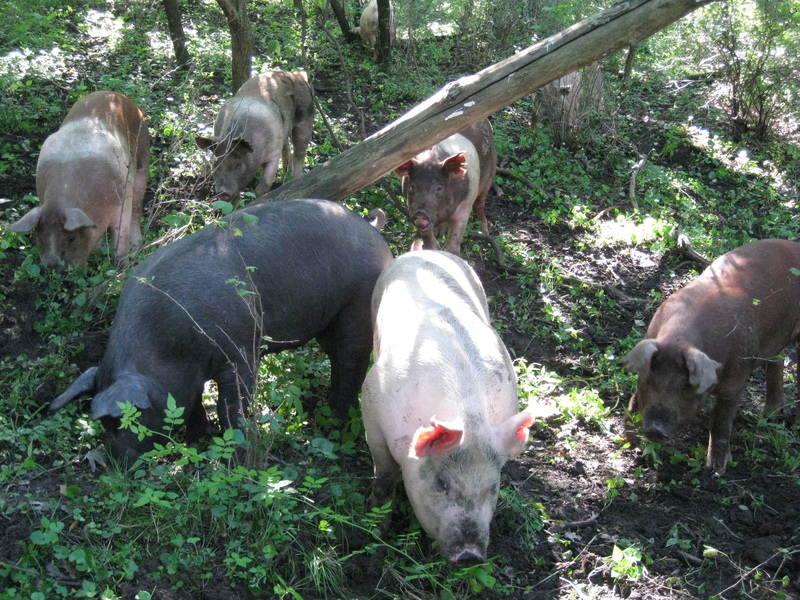 Hogs like hoop buildings and alfalfa/grass pastures, but they love the woods. But alas, the fence surrounding this woods is not hog-secure, and I’m not going to be known as the farmer who introduced wild hogs to Lafayette County, so I herded them back to their pen. Wild hogs are nothing but trouble. A guy released some in Crawford County, Wisconsin and they survived the Wisconsin winter and have become a real problem. But I like the idea of fattening hogs on apples and acorns. Joel Salatin does it. Why can’t I? You are currently browsing the archives for the Curious weeds category.